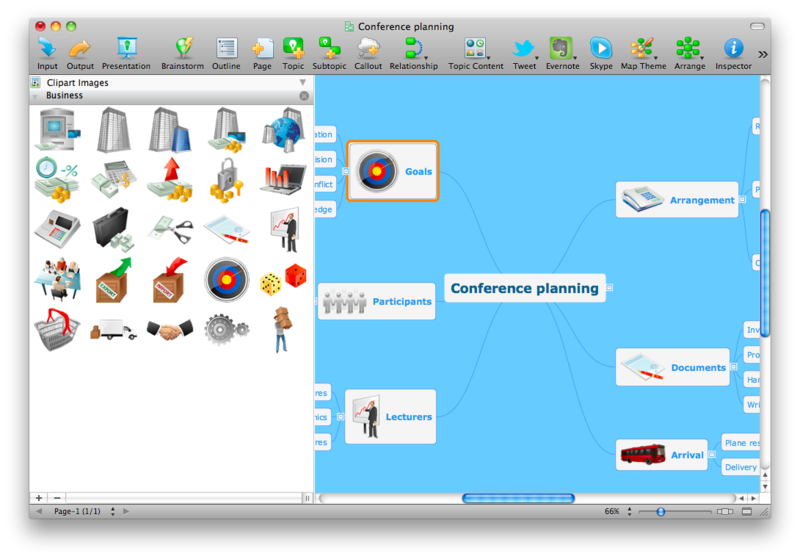 ConceptDraw MINDMAP is ideal conference planning software. It offers you a wide set of useful tools and drawing capabilities allowing you create professional looking conference planning Mind Maps. ConceptDraw MINDMAP provides large number of galleries with great quantity of various clipart that you can use for simply and quickly design your Mind Maps. ConceptDraw MINDMAP contains also large gallery of professionally designed templates and samples of mind maps. They demonstrate various applications of the program for personal, business, or education use. All predesigned templates and samples in ConceptDraw MINDMAP are available for editing. This Conference planning mind map was created in ConceptDraw MINDMAP It is available for editing, if needed. Use ConceptDraw MINDMAP software for effective Conference Planning!